Clermont, Or Clermont-Ferrand, a town of Auvergne, France, capital of the department of Puy-du-I)6me, 215 m. S. S. E. of Paris; pop. in 1866, 37,690. It is situated on a hill between the rivers Bedat and Allier, in a mountainous region at the foot of a range of extinct volcanoes, the highest of which is the Puy-de-I)ome mountain. A line of boulevards extends almost round the circuit of the town. In the place de Jaude, the principal square, is a statue of Desaix, and another square is named after the poet Delille, who, like that general, was born near Clermont. Pascal was a native of the town. 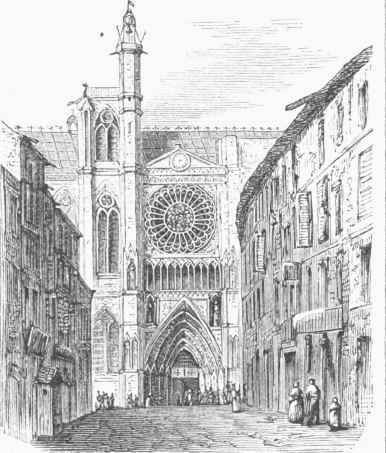 The W. part of the cathedral, which was greatly damaged during the revolution, was pulled down in 1855, and has since been in course of restoration. The most ancient church is Notre Dame du Port, of the 11th century, with a modern tower and the statue of a black Virgin, reputed to have miraculous powers. The palais de faculte contains several museums and collections, and a public library with 30,000 volumes and curious ancient MSS. In the centre of the Cours Sablon, extending; along the east of the town, is a line fountain. There are two medicinal springs. The most famous, in the suburb of St. Alyre, called la fontaine petrefiante, issues out of a volcanic tufa resting upon granite. A large stalactite forms a species of bridge, and both fountain and bridge are situated in a garden to which a bath house is attached. The town contains a society for science and tine arts, an academy, a lyceum, a medical and pharmaceutical school, a normal and a theological seminary, and schools of design, of trades, and of geology and botany. There is an active traffic in agricultural productions, and an important transit trade with Paris and southern France. Silk, linen, cotton, hemp, leather, cutlery, chemical articles, lava ware, and other goods are manufactured. - Under the name of Nemetum or Nemossus, Clermont was the capital of the Arverni, and was enlarged by Augustus, who called it Augustonemetum. Subsequently it was destroyed, and on being rebuilt it received the present designation from the castle of Clarus Mons, which defended the town, and it became the capital of Auvergne, sharing the subsequent fortunes of that province. It is one of the oldest bishoprics of France. The most celebrated of the many ecclesiastical councils held here was that of 1005, when the first crusade was resolved upon, the badge of the cross worn by the crusaders being first adopted here. Clermont and Montferrand were separate towns till 1G33, when they were united by avenues, 2 m. long.